Holiday Inn is in the middle of an extensive "rebranding" of it's hotels and image. 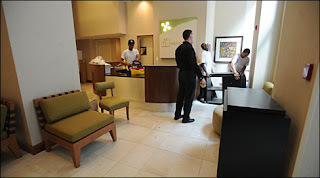 The Holiday Inn chain is one of the oldest in America and hasn't gone through a major change in its look in some time. New bedding that redefines the look and feel of each guest room with fresh, white triple-sheeting and pillows that come in two comfort levels: “soft” and “firm.” An enhanced bathroom that features an improved showerhead offering superior pressure, as well as a signature shower curtain with curved rod and new amenities to deliver a consistent bath experience that feels fresh and contemporary. A best-in-class service culture – “Stay Real” – to further ensure the team develops the behaviors and skills to best serve guests so they feel like individuals and not numbers. Genuine people delivering real service. Leading the charge, will be a newly created position at each hotel – the Guest Experience Champion. The Holiday Inn in Chelsea was one of the first to undergo the brand change. In the lobby of the hotel features hardwood floors, river rocks and Japanese plants. The contemporary design is meant to appeal to its Baby Boomer customer base, as well as younger travelers who might pick one of the stylish, midprice hotel brands recently launched, such as Aloft, Element or Hyatt Place. they should include free wifi....i'd stay there all the time!! ps- Sorry I have been MIA. Traveling didn't give me enough time to check blogs!!!! I'm back now though!! !